Since Disney took over the reins of the Star Wars franchise from George Lucas, its goal has been to expand the universe. First it started its own trilogy, with The Force Awakens (2015), and then showed us the people behind the destruction of the Death Star with the standalone film Rogue One (2016). 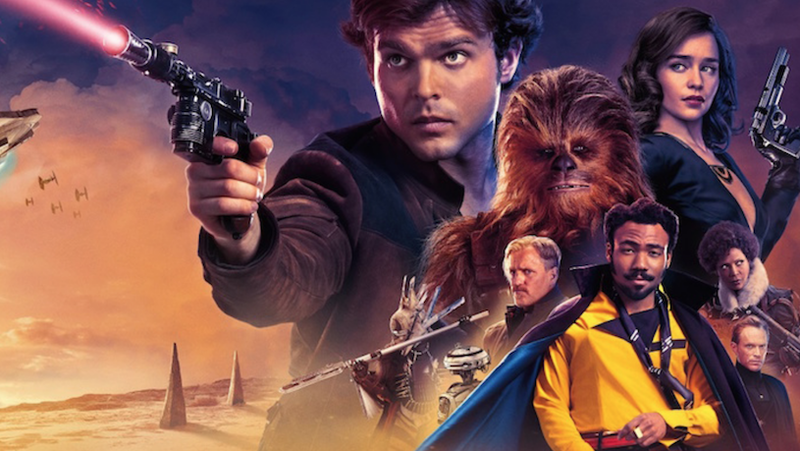 This year, hot on the heels of base-breaker The Last Jedi (2017), we are invited to witness the backstory of roguish and cynical smuggler Han Solo (icon of the original trilogy and a highlight of Harrison Ford’s career) in Solo: A Star Wars Story. Directed by Ron Howard (Willow, Far and Away, A Beautiful Mind), who took over halfway through production and reshot a good deal of the film, Solo is a curious entry into the Star Wars canon. The plot is a slightly wiggly line with few deviations. There are no standout moments and nothing underwhelming either. Han Solo escapes from his unhappy planet, unfortunately abandoning the girl he loves, and becomes involved with a group of criminals (including Woody Harrelson) who report to the big bad, Dryden Vos (Paul Bettany) and his shadowy organisation. There is a great deal of action and everything zips along at a nice pace, interjected with good humour and nods to things fans will recognise. There are emotional moments, but many plot points would have benefited from deeper exploration, such as the relationship and history between Qi’ra (Emilia Clarke) and Dryden Vos. While interjecting a few of Harrison Ford’s mannerisms and quirks, Alden Ehrenreich manages to make this younger version of Han his own man. His talent is enough that he truly becomes this version of Han Solo, rather than just doing an impression of him (as a lesser actor might have done). Donald Glover as Lando Calrissian is also worthy of praise as he delivers a smooth and humorous take on the smuggler previously portrayed by Billy Dee Williams. The score, composed by John Powell, is unusual in places and used to great effect, providing an oftentimes beautiful background to even the simplest scene. Overall Solo is well worth a trip to the cinema. It has more of the feeling of those first three films from the seventies and eighties, both in production design and tone. Though there are gaps in the plot and characterisation that could easily have been filled, there’s enough there to hold audience interest. Slightly retro, honestly funny, and nearly as cool as its protagonist.